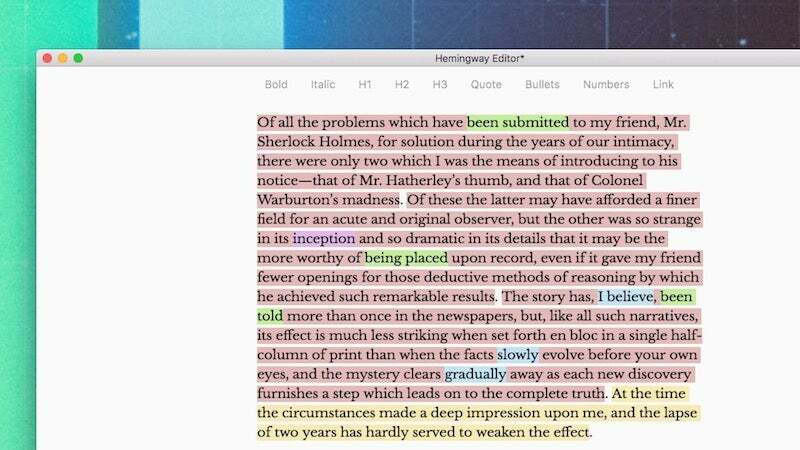 Windows/Mac: Hemingway was originally a clever little web app that highlighted common writing errors to help you edit. Then, it came to desktop. Now, it's getting a free update that adds in a new distraction-free editing mode and PDF export. You can now hide the sidebar in Hemingway, which means you can sit in edit mode without that clunky list on the side to distract you while the highlighted blocks of passive phrases, complex words, adverbs and wordy sentences remain. The app's general interface also gets cleaned up a bit, swapping out the formatting icons at the top for plain old text. You can also now save and send PDFs that include the editing highlights. Finally, Hemingway can now publish directly to Medium or Wordpress. It's a free update if you already own the app, though you'll need to manually download it using a link sent to the email address you originally purchased Hemingway with. It also comes with a price bump to $US20 ($27), which is a bit hefty if you didn't snag the app back when it was $US5 ($7). Thankfully, the web app, as always, will continue to be free.